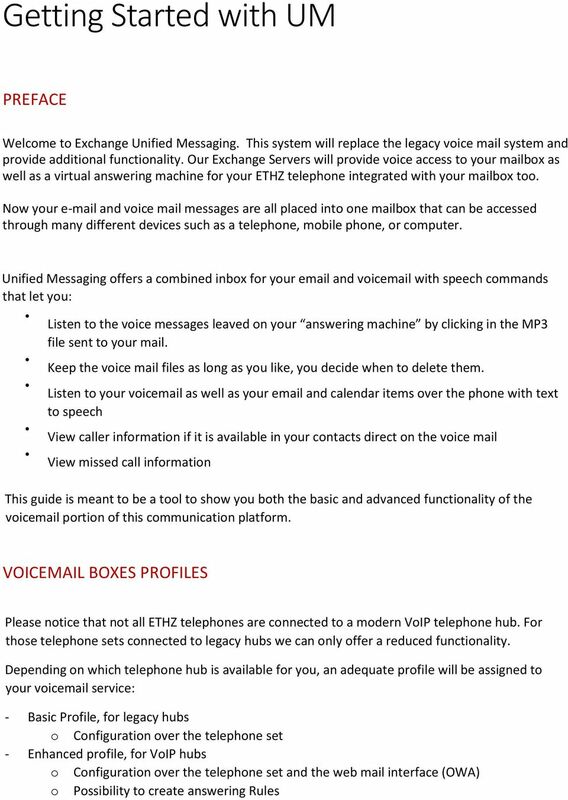 Download "Getting Started with UM"
2 TYPES OF VOIC BOXES Individual Voic Users This is the most common type of mailbox. After your Exchange mailbox and your telephone number have been enabled for Unified Messaging Voic you will receive a welcome from Exchange containing: The telephone number to access voice mail (39990) Your UM Policy (Enhance(/Basic) Your extension number A random generated PIN Shared & Departmental Voic Users A shared or departmental voic box is set up for situations when more than one person manages the messages. The shared departmental voic box must be attached to an address so that both messages and voic messages are captured in the same account. Setting up such a voic box requires coordination between all the individuals who have access because one person will need to record the name and greeting as well as change the PIN. Once these steps are taken the voic can be managed entirely through Outlook. However, the PIN should be communicated to all users as access is needed through the telephone at any time. 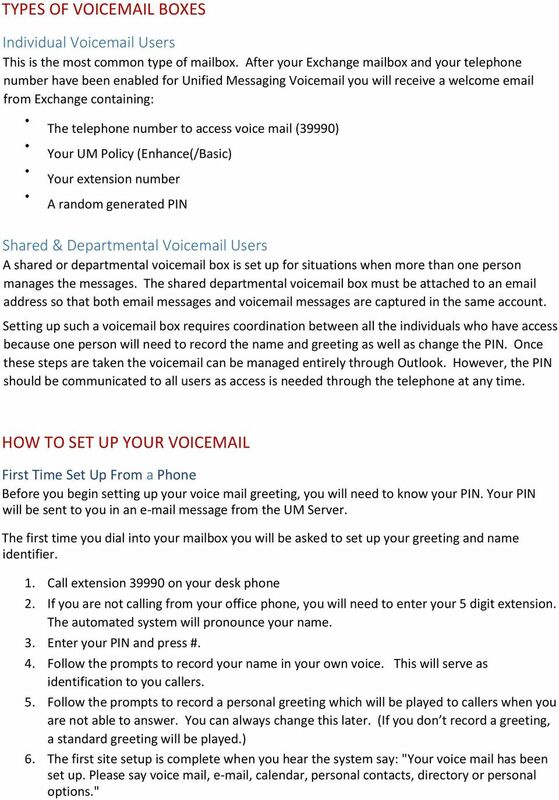 HOW TO SET UP YOUR VOIC First Time Set Up From a Phone Before you begin setting up your voice mail greeting, you will need to know your PIN. Your PIN will be sent to you in an message from the UM Server. The first time you dial into your mailbox you will be asked to set up your greeting and name identifier. 1. Call extension on your desk phone 2. If you are not calling from your office phone, you will need to enter your 5 digit extension. The automated system will pronounce your name. 3. Enter your PIN and press #. 4. Follow the prompts to record your name in your own voice. This will serve as identification to you callers. 5. Follow the prompts to record a personal greeting which will be played to callers when you are not able to answer. You can always change this later. (If you don t record a greeting, a standard greeting will be played.) 6. The first site setup is complete when you hear the system say: "Your voice mail has been set up. Please say voice mail, , calendar, personal contacts, directory or personal options." 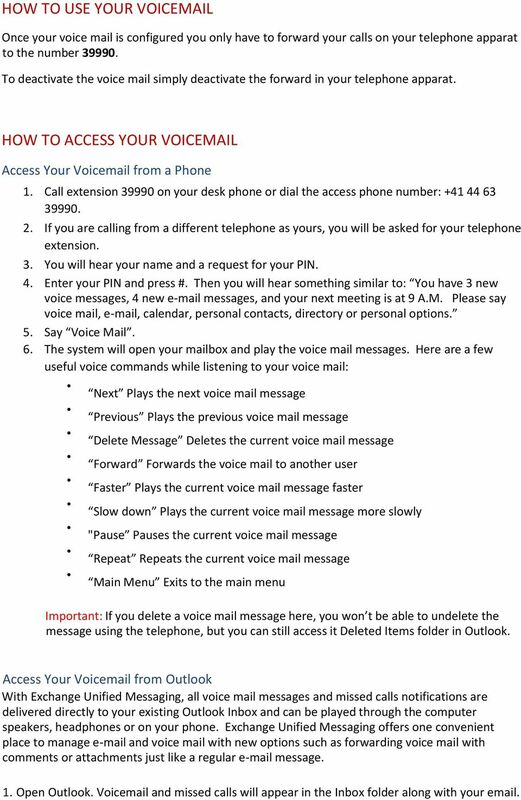 3 HOW TO USE YOUR VOIC Once your voice mail is configured you only have to forward your calls on your telephone apparat to the number To deactivate the voice mail simply deactivate the forward in your telephone apparat. HOW TO ACCESS YOUR VOIC Access Your Voic from a Phone 1. Call extension on your desk phone or dial the access phone number: If you are calling from a different telephone as yours, you will be asked for your telephone extension. 3. You will hear your name and a request for your PIN. 4. Enter your PIN and press #. Then you will hear something similar to: You have 3 new voice messages, 4 new messages, and your next meeting is at 9 A.M. Please say voice mail, , calendar, personal contacts, directory or personal options. 5. Say Voice Mail. 6. 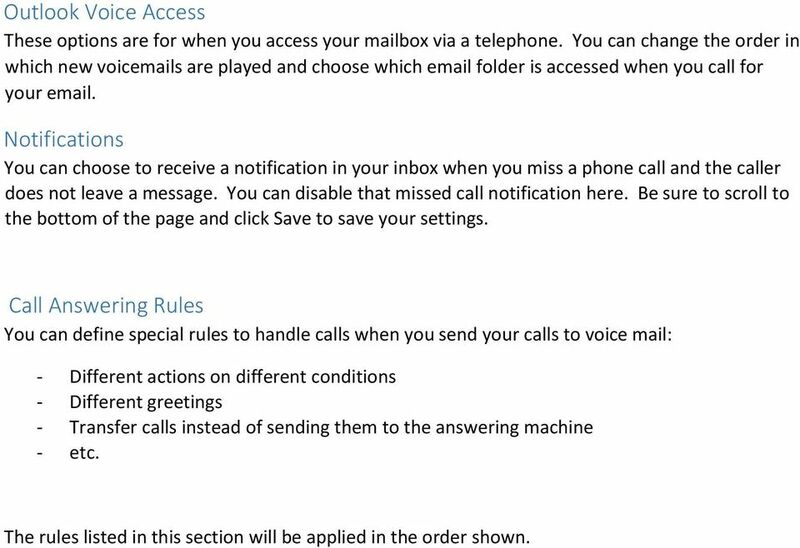 The system will open your mailbox and play the voice mail messages. Here are a few useful voice commands while listening to your voice mail: Next Plays the next voice mail message Previous Plays the previous voice mail message Delete Message Deletes the current voice mail message Forward Forwards the voice mail to another user Faster Plays the current voice mail message faster Slow down Plays the current voice mail message more slowly "Pause Pauses the current voice mail message Repeat Repeats the current voice mail message Main Menu Exits to the main menu Important: If you delete a voice mail message here, you won t be able to undelete the message using the telephone, but you can still access it Deleted Items folder in Outlook. Access Your Voic from Outlook With Exchange Unified Messaging, all voice mail messages and missed calls notifications are delivered directly to your existing Outlook Inbox and can be played through the computer speakers, headphones or on your phone. Exchange Unified Messaging offers one convenient place to manage and voice mail with new options such as forwarding voice mail with comments or attachments just like a regular message. 1. Open Outlook. Voic and missed calls will appear in the Inbox folder along with your . 4 2. Double click on the message (or view the reading pane) and you will see an integrated Microsoft Windows Media Player. 3. Simply click on the Play button and listen to the message through the computer speakers. 4. If the calling telephone number is known to the UM Server you will also receive additional information about the caller such as mail address, other telephone numbers, etc. MANAGING VOIC OPTIONS THROUGH OUTLOOK WEB APP The best way to manage your voic options is through the Outlook Web App (OWA), which you can access directly via the web at or through the File tab of Outlook From OWA you can reset your PIN, select Greetings, manage your Voice Access, specify your Play on Phone settings, choose your Voic Preview preferences, and specify your notifications. 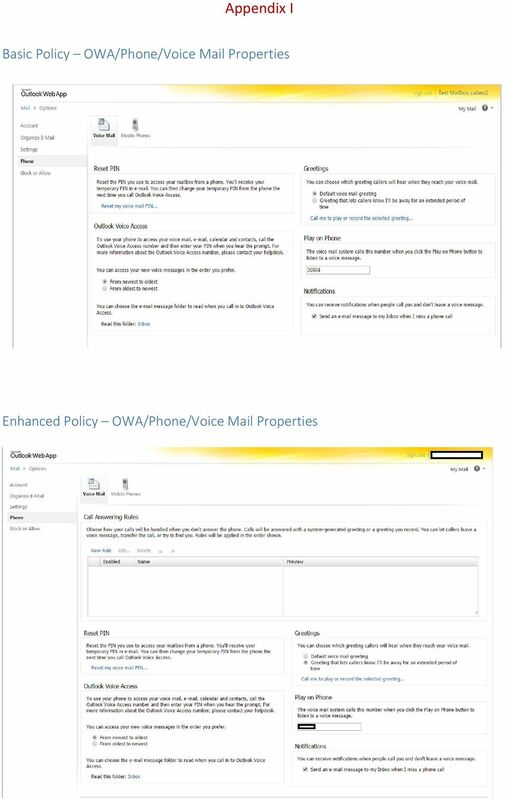 Accessing Voice Mail Options through Outlook Web App 1. Go to and login 2. Click on the Option button on the upper right corner of the window 3. From the left-hand menu, click the Phone link Accessing Voice Mail Options through the Outlook 2010 for Windows 1. From the File tab, click on the Info button 2. Select Manage Voice Mail (at the bottom of the page). 3. This will send you to OWA to continue managing your Voic . Both previous options bring you to the configuration window. What you will see here, depends on your Profile (see pictures in Appendix I). Reset PIN 1. Click the Reset my voice mail PIN link and verify you want to reset your PIN in the dialog box that appears. 2. An containing a new temporary PIN will be sent to your inbox. Greetings 1. Click on a radio button to select the desired greeting option. 2. Click Call me to play or record the selected greeting to listen to and/or change your greeting. 3. Be sure to save your settings by clicking Save at the bottom of the page. 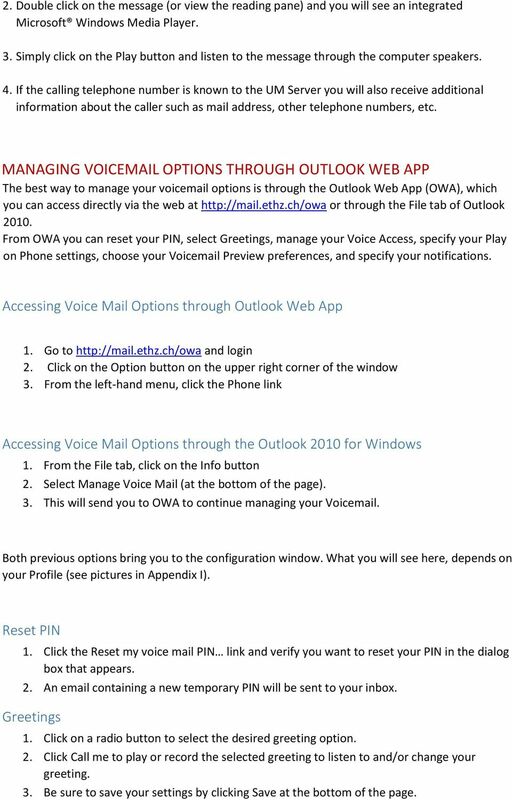 5 Outlook Voice Access These options are for when you access your mailbox via a telephone. You can change the order in which new voic s are played and choose which folder is accessed when you call for your . Notifications You can choose to receive a notification in your inbox when you miss a phone call and the caller does not leave a message. You can disable that missed call notification here. Be sure to scroll to the bottom of the page and click Save to save your settings. Call Answering Rules You can define special rules to handle calls when you send your calls to voice mail: - Different actions on different conditions - Different greetings - Transfer calls instead of sending them to the answering machine - etc. The rules listed in this section will be applied in the order shown. Cisco Unity Connection Voicemail User Guide: Your Unity Voicemail Mailbox The Cisco Unity Connection Voicemail system provides each user a Voicemail Box. Messages in your Voicemail Box are not stored indefinitely. What s New in Exchange 2010? Communité - MIC. Frequently Asked Questions. 1. What is Communité - MIC 3.0 (Messaging Interaction Center)? XPRESSIONS USER GUIDE 1 WHAT IS XPRESSIONS? A voicemail system that enables access via the telephone or by PC/MAC. NOTE: Siemens no longer supports the current PhoneMail system. Xpressions is the replacement. Welcome to your new ShoreTel 230 voice over IP telephone. Presence & IM. Quick Reference Guide. Build your Contacts list. Getting started. What does your Presence status mean? Getting Started. Sign in and get started. If you re already logged on to your organization s network, sign in by starting Lync.